The path, as we know is ever changing. Trying to manipulate what is, only causes suffering. To go with the flow creates harmony within. As I wait for my brother to take me back to Santa Cruz, I contemplate these thoughts. We react to happenings along the path, but as we round a corner events occur that are beyond our control. So, in embracing the path, I realize that all parts need to be embraced, even those things I don’t understand. So many times in my life I have found myself asking why ? I have discovered , because it just is . This past week I have hit the highest of highs and the lowest of lows. As I entered the Sierras my heart was full. The ever-changing landscapes, the strength of the mountains, the songs of the wind, and the immense peace within filled my heart with gratitude. The reasons I chose to walk this trail became clearer. My relationship with the natural world became stronger. 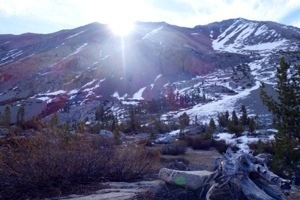 The snow covered peaks brought a new dimension to the Sierras. It was magical. The sun glistening on the snow creating a path of diamonds. It was breathtaking. We made a group decision to skip the climbing of Mt. Whitney as most of us had climbed it already this year. At 4 am we awoke to make the trek towards Forrester Pass. We were trying to make the golden hour of 11:00 to be up and over the pass. The ascent was long, yet spectacular . Glancing ahead every few steps filled me with excitement. The power emanating from the mountain was intense. Even though I was with a group , it became a personal challenge with every step. 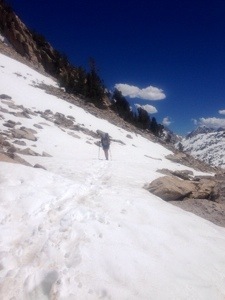 The trail, because of the new snow wasn’t as well established as it was when I hiked the JMT. WhyNot?! and I are the strongest hikers so we shared leading the group. We broke into two groups for awhile., Poco and WhyNot ? !, Spirit, Ghost and I. Little did we know that an even scarier section was approaching . 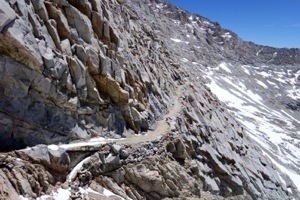 A very rocky, slick section right before reaching the pass.Poles in one hand, gripping the rocky ledge with the other we pull ourselves up, and are at last standing on top of Forrester Pass, the highest pass on the PCT. What goes up, must also go down. A very snowy descent was before us. I led the way down. The post holing was non- stop. It was my first experience with it. It became very difficult. I had to surrender to total loss of control. Poco and I got off trail. I heard the call back. I assumed she was behind me. She wasn’t . I resumed my place with the group. Suddenly we heard the sickening sound of something falling down the mountain. It was Poco’ s pack. Panic arose within each of us . Where was Poco ? She was alone . She felt abandoned. . She made her way down the mountain, off trail. It as dangerous. Frightened and feelings of abandonment led her back home to Napa. However, I just heard.. She is joining the group back in Mammoth. I am stoked for her!! I began to feel a twinge in my back. It started about 6 days ago . I tried to ignore its persistance. The climbs didn’t bother me, however the descents , the slipping on icy snow, the boulder hopping and the post holing were seriously affecting my speed with which I proceeded down the trail. When I started this trail I was one of the lead walkers . I was so far behind that my team was having to take off their packs and wait for me. With each step my sense of joy was replaced by pain, physical and mental. I was afraid as to what was happening. 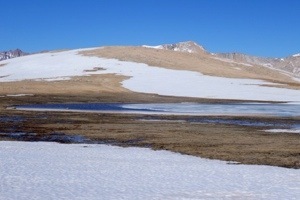 Once we began the climb up Glenn Pass I knew I was in trouble. I was really slow. WhyNot?! did an amazing job at navigating. I became a follower. Wincing at every step, I climbed upward. Fear showed its disruptive head. I began to doubt my ability. With a very huge sigh of gratitude, I made it to the pass. Exhaustion, yet elation filled me. We eventually made our way to the lovely Rae Lakes . I was consumed with exhaustion. 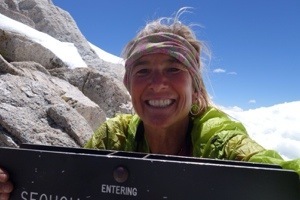 So many sweet memories flooded my senses of last summer on the JMT and the storm , and my friend Tom. I awoke the next morning with ice covering my bag. We planned to get as close to Pinchot Pass as we could for the next days ascent. I only made it to Woods Creek. I fell so far behind. Tears flooded the path. 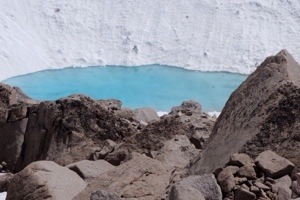 Every time a snow , water, or boulder crossing appeared I looked at it with dread, trying to figure out which foot to lead with, which would cause the least amount of pain. Spirit, the kind sweet soul she is waited for me around every bend. She came bounding up the trail at one point, took my pack and wandered down a way . The reality of my situation was settling in. I had to leave the trail. It wasn’t fair to my group . Walking alone, WhyNot?! Appeared , took my pack, said she and Spirit had been talking. I caught up at Woods Creek. They decided I had to hit SPOT. I couldn’t make it either way , forward or backward as the passes were basically an impossible situation for me at this point. There was another trail, but we knew nothing about it. I refused to hit SPOT. We sat quietly . Within the next hour our dilemma had been solved. . Some folks hiking south knew of the Paradise Valley Trail . They said it was all downhill, no worries, no snow, and no passes. I walked 15 miles out the next morning. I walked alone as I insisted my friends carry on. A deer befriended me. It’s antlers were broken. Perhaps he knew I was broken also. 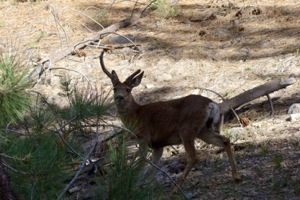 He wandered the trail in front if me for about7 miles. Stopping, looking back and walking ahead. Meaning? He felt my pain somehow. It was a blessing. My tears watered the earth below my feet. I hurt physically and mentally. I loved this trail. 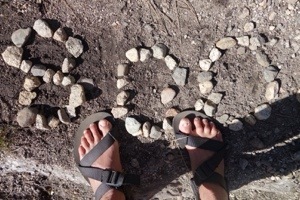 This experience of walking the PCT. Why ? Once I let go of the why, I was better. I am home . I will see my doctor. I will decide if within this 3 week window I am strong enough to get back on the trail. If not, I will find another walk . I will carry less weight. Your blog title is so fitting for this life speed bump. During this past year you have lived the life many of us dream, testing and stressing the boundaries of our mature bodies. You, much like me, find the trail and nature our wellness clinics, thus I hope you find after a bit of rest you are recovered and can continue this journey or another that suits you. You have a rare spirit, one that needs to soaring. Heal well my friend. Sending you healing vibes, hugs and love ! Ah, I am so very sorry for your pain–mental, spiritual and physical. In 2010 I had to get off after Forrester, due to health issues as well. It was the hardest decision, and full of tears. Each hiker age has different challenges. I have followed as you have hiked with grace and passion. You are leaving the trail with grace. I pray your back heals, and that you can return to the trail with your crew. Three weeks worked for me, I hope it is the magic number for you. Thank you Dane.. Actually I am exploring pack options as I sit on this bag of peas!!! Those decisions are always so difficult to make. Sounds like you’ve had an amazing journey and it is just leading you in a new direction now. My back always feels better with a lighter pack. In the past I’ve had great luck with seeing a chiropractor, though there are probably better holistic practices now. My lower back creates a lot of issues for me. Lying on my back and stretching my legs back behind me, in various patterns, helps a lot. That, and I sleep with a pillow between or under my knees to take the pressure off my lower spine. I’m sure some rest without the pack will help with your healing.